Have an Amazing, Music-Filled Holiday Season!!! The first one is the “Ask Me a Piano Question” page. Thank you so much for your captivating questions – we have reached almost 300 questions and answers, exploring so many fascinating aspects of piano playing! 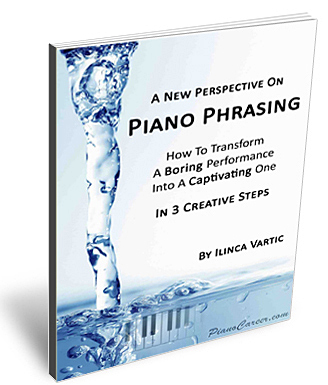 The second is my video project – in September I recorded my first video tutorial (The 5 Basic Elements of a Correct Piano Posture) and since then I tried to post at least 2 videos per month – and it’s certainly only the beginning! 2012 is almost here and I currently have several new projects ‘in development’ – I plan to begin working on them starting from January! When the end of a year is approaching, we usually think about what we would like to achieve during the next one! Reaching goals is not always easy, especially if you’re only beginning your piano journey and you have nobody to share your progress (or your problems) with. That’s why I’m here and that’s why this is not only a site about holistic piano playing, but also a friendly community of piano enthusiasts! You can always ask questions, share your experience and receive encouragement and motivation whenever you feel down! So join our “Questions” page (if you haven’t already) and let’s stay in touch! Did you set your pianistic New Year resolutions? Which are your musical goals for the year to come? What pieces do you plan to learn? What piano skills do you plan to develop? Share your piano goals in the comments below! You can also tell us what lessons your learned from the biggest accomplishments/disappointments of 2011 – it’s always extremely useful to look back for a short (yet meaningful) analysis. MERRY CHRISTMAS and a Happy, bright, successful and incredible New Year!!! Thank you for your lovely “Merry Christmas” video. It was great to see you playing very nice festive music. But why were you at the back of the orchestra? You deserve to be in the front!! I hope you’re enjoying all the concerts you’re doing. Have a wonderful Christmas too, even though you only have a couple of days off. Enjoy all the festivities with your family and have a Happy New Year. I wish you a happy and healthy 2012 filled with all what you hope for. Yes, I have set my New Year resolutions for piano. Not only that I will also look forward very much to whatever you plan to do on your site. I have learned a lot from you of which I’m very grateful. I’ll endeavour to keep improving, even if it’s slow, or frustrating at times. It’s all part of learning and growing. I can’t wait for you to share more of your “secrets”! I wish all your readers too a very happy Christmas and New Year. Alexandra – keep your spirits up and enjoy whatever you’re playing – you’re doing well. I hope 2012 brings much joy and reward in your love of the piano. Keep warm and well Ilinca. See you in 2012. Merry Christmas!!! I hope you’re having a wonderful time today! Today is my only day off and I plan to dedicate at least an hour or two to PianoCareer – your comments are always such nice gifts! :). Thank you also for your warm wishes to my readers and to Alexandra!!! By the way, your comment inspired me to write a little about orchestra traditions. Actually, musicians sit in an orchestra according to the power of their instruments – and not to ‘how good’ they play. Strings (violins, violas and cellos) have the least powerful sound – and that’s why they sit in front, so the public will hear their playing very well. Wooden wind instruments are more powerful than strings – this is why they sit behind them – in the middle of the orchestra. Brass winds are very powerful, that’s why they sit in the back – and not because they play worse than the others LOL! Percussion is even more powerful, and they sit sometimes behind the brass, other times in the same row as the brass. The instruments which I just named are traditional for any symphony orchestra (this distribution ‘pattern’ was established long ago by Joseph Haydn himself). Then, we also have the relatively ‘modern’ instruments, which began to be used in an orchestra in the late romantic period (the second half of the XIXth century) – the piano and the harp. Their sonority is more powerful than the sonority of the strings, but less powerful than the one of the brass or percussion. That’s why piano and harp are usually positioned at the sides (that’s where I sit in the video – on the left side – and not in the back; in the back are the brass wind instruments – the trumpets and the trombones). Another reason is the big size of these instruments (especially if we talk about a Grand piano) – it would certainly not fit between the strings! Then, in the 20th century, even more modern instruments began to be used in orchestras: bass-guitar, drum set, other specific instruments. They are usually positioned near the piano (especially in playing pop and rock music) – and together they form the so-called ‘rhythm-group’. A pianist is sitting in front of an orchestra only in two cases: if he/she is playing a concert for piano and orchestra or if he/she is playing on a real harpsichord (which has a very low sonority!). The synthesizer can play as loud as needed (even louder than the brass!) so there’s no ‘acoustic’ need to place it in front! But, above all, playing in an orchestra is like being part of a big friendly family! :). I have amazing colleagues which I love and respect – and our performances are always fun and enjoyable! Have a great day today and talk soon! Happy Holidays!! Thank you for your encouragement! 🙂 I hope you are enjoying a warm and wonderful holiday with friends and family. Maybe you were even able to play some Christmas music? Best of luck in your piano progress too, Pauline! 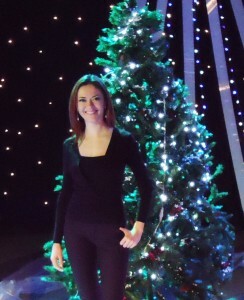 I look forward to your 2012 questions and comments 😀 Let’s all grow together under the kind and wise guidance of Ilinca! Cheers to Ilinca Vartic! Cheers to PianoCareer.com! Thanks Ilinca for writing me back on Facebook, i do hope you did have a wonderful Christmas, I’m surprise you had your Christmas concert during Christmas Eve, and I always thought you have it before…speaking about Christmas concert, I always agree with your viewer that you should be at the front, instead at the back; however, i do enjoy listening to it, and many more to come, when you post it up [it doesn’t matter if it’s tutorial or another music]…i will always enjoy it, whenever i have a chance and to check it on youtube…I’m glad you post it up though….about my New Year Resolution, before i say it, when i was young, i started to play a piano — as i get a little older, i did a little less playing, and did other activities…once we grown up, my parents have to get rid of the piano, because it was getting too old, it was falling a part, and no one was really playing it….just in a few month, i start to watch youtube and watch other pianist play their piano — as i was watching it, I thought to myself, “Gee, I wish i can play like them, and to have fun playing it?”…so i got an I pod touch with an app, and started playing recently [I know it’s not an actual piano, but it sounded like it]…..to tell you the truth about my New Years Resolution; i just do it day by day, hope for the best of what each new day has to bring me….but if I have one New Year Resolution, it will be try to have better health, stress free, enjoy life as a daily routine, and to try have best of the ability that you can try [rather if it’s good or bad of each passing time]…of course after your daily routine is to always have fun when you have time to yourself [i know most people think there is no time, but there is and to make room for it]….mine is relaxing, eating, and of course playing a piano….thanks for taking your time reading it, keep up the good work, and best of 2012?!!! Thank you for your comment and Merry Christmas!!! Thanks for sharing with us your piano adventures and your New Year resolutions. Actually, what you said is very wise: taking it one day at a time and realizing that there’s always time for doing things we enjoy! Good luck with exploring the piano this year (even if it’s on an iPod)! If you truly love music, the important thing is to start somewhere and then take small steps towards your goal! 😉 And not forget to have fun in the process! You can also read my answer for Pauline above – it’s about the instrument positioning in a symphony orchestra – I explain why everyone is sitting the way you saw in the video. It was so fun to see your Christmas TV special video, and to see you in action 😀 !! Yeahhhh! (Also, the lighting and set design was lovely, at least from the perspective of the video camera. Nice deep blues and greens, very wintery and pretty.) And you were in great form as is to be expected: great posture, relaxed, expressive, and all the rest!! Thanks for taking the time and posting for us to enjoy. This holiday, I’ve been trying to keep up at least some piano practice time (although most days 30 minutes or less on my current pieces, including Bach and Schumann). I spent some time enjoying and sight-reading through some traditional standard Xmas music. Good practice, and not as mentally taxing. 😉 Today, I had a chance to get in 3 hours. So refreshing to sit and play and be able to concentrate on only the piano. So, that was the end of my 2011 piano experience (not including my usual practice time). If nothing else, it showed that I do in fact have some big hurdles to overcome yet. On a good note, this year, the mental transition to sight-reading and playing, instead of memorizing to play with fingers, is going very well; remembering to (try to!) relax; listening to the sound of my playing and the different “voices”; being aware of key attack/touch control; correct posture; and remembering to balance my passion for piano with the reality (and joy) of my life, are all becoming part of me, thanks in very very large part to your kind encouragement and insights. I cannot wait for 2012!! I will continue with more Bach inventions under my teacher’s guidance and maybe try his 3-part Sinfonias in 2012. Also, hoping to start Rachmaninov’s Prelude No.4 in Dmaj., which my teacher has approved to attempt possibly in 2012. Have a beautiful, warm , fun, happy holiday, Ilinca!! This site is so awesome and am grateful each time I can access it for posting and reading! As always, thank you for sharing and for caring. Best wishes for a successful and enjoyable New Year!! P.S. I posted another comment last week under AskMeAQuestion; I know you’re busy now, but I am hoping you will reply later!! Thank you for this wonderful comment and for your warm wishes! I also just replied to your question on the previous page – click here to read my answer! Also, thank you for sharing with us your latest piano adventures! Performance Anxiety is certainly not for guys only! LOL It is also an indissoluble part of the life of any musician/actor/dancer. It’s impossible to get rid of it completely, but it’s certainly possible to tame it, to learn how to control it and to transform all negative emotions into positive ones. This, however, requires practice. The best known way of reducing performance anxiety is performing more often! Yes, it’s as simple as that! Also, let’s not forget that you didn’t have much time to practice before your performance. It’s extremely important to be in good shape and to warm up before playing for an audience! Only great and extremely experienced pianists can play brilliantly with only several minutes of warming up. For the rest of us (especially for beginners!) it’s very helpful to practice before a performance and to make sure that the fingers are flexible and in good shape. Another advice: when you play for an audience (and don’t forget that you should do that more often for getting used the new ‘psychological’ environment) play with the score in front of you! Who said that you should play from memory? Yes, this is a mandatory requirement in school, but you are an adult and you create your own rules! After all, what matters the most is how the piece sounds – and not the fact that you have a score on the piano or not :). This way, the transition towards a comfortable performance will be more gradual. I’m also really happy to hear that you learned so much during 2011 and I’m even happier to know that my site played a part in your progress! Also, have an amazing holiday season!! !